Asia has some fantastic food, and a lot of it, with so many different regions with their own cuisine. The choices here in Vorarlberg may not be that extensive and with a lot of restaurants offering a whole mix of different asian cuisines, it can be hard to find places that really showcase the best of each region. Korean food is not a cuisine that I have eaten a lot of, but was really keen to try, and after a few different people recommended OKims in Hard to me, I couldn’t wait to find the time to go. So when deciding where we would go on a Saturday night, a table at Okims seemed the perfect choice. When you drive past the restaurant you could mistake it for any other Traditional Austrian Restaurant, however once you step inside everything changes. The restaurant was designed by a St. Gallen Architecture firm in the style of a traditional Korean Madang (a large outdoor space in traditional Korean houses, serving as an important social space). Simple, functional and practical are the words they use to describe it, with large wooden benches encouraging a really socialble atmosphere and sphere lights hanging from the ceilings giving you the sense you are sitting under the nights sky. Traditional artefacts line the display cabinets which divide the restaurant, and all in all results in the feeling that you are really going to enjoy a complete Korean experience. Their menu helpfully has photos of every dish, which for a non German and non Korean speaker, was extremely helpful for me to make up my mind. For a Korean food novice like myself, on first glance of the starters, you could be fooled into thinking that again you have stumbled upon another Asian Restaurant offering all types of cuisine, as the first page looks deceptively like Japanese sushi. However, after doing a little bit of background research, I now know that Kimbap is the Korean answer to sushi rolls. The difference being the rice is cut with sesame oil and is sweeter and the fillings tends not to be raw fish. Here their rolls are filled with colourful vegetables and egg. Their Korean style pancakes also looked amazing, and the soups looked tempting, but our love for dumplings (and longing for finding somewhere that offers them) meant we could not go passed the Mandu to start off our night. Moving onto the main menu and Korean food primarily consists of meat, rice and vegetables and in line with the overall social experience, a lot of the dishes are meant for sharing, so grab a group of friends and start making your way through the menu. One option is the Bulgogi table grill, where they will bring you a gas grill for your table and you prepare your own meat (the clue is really in the name). Just choose your preferred marinated meat (beef; spicy or mild, or chicken),and cook until your hearts content, by constantly basting it with broth. I’ve personally never understood the concept of paying to go out for a meal and then you have to cook for yourself anyway and so we chose the beef Bulgogi already prepared in the kitchen. This was only the mild version (after consultation with the wait staff we decided we would air on the side of caution for my delicate tastebuds) but was absolutely amazing, full of flavour and you definitely will not go hungry. 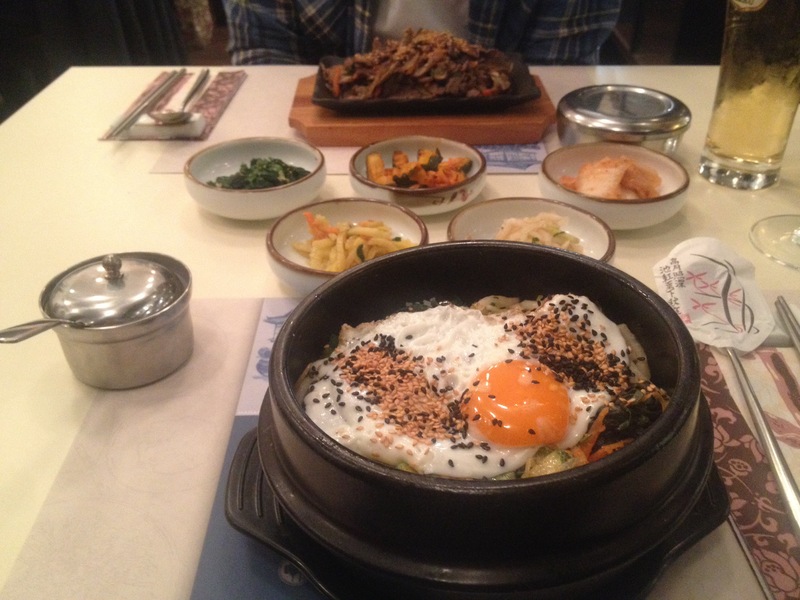 We also decided to try their other speciality, Bibimbap. This is served in a hot stone pot and consists of a bed of Rice, topped with an array of steam vegetables, marinated beef and covered with a fried egg. The waiter explained exactly how the dish should be eaten as they would traditionally in Korea. This aim of this dish is to stir everything together really well (adding the child paste at your own risk ;)) and eat it with a spoon rather than chopsticks (which is a shame, as they have really nice metal chopsticks here). Once you have it all mixed up it may not look that appetising, but it tastes fantastic. We had chosen the vegetarian option, but I think the beef would have been even better. They also offer a lot of tofu, fish and vegan options. The meals are also served with a number of side dishes like marinated cabbage, spinach and courgettes (a word of caution, some of these will set your mouth alight). All in all we had a great Korean experience, but naturally, there is always room for dessert (not that we needed it, but thats not really why you order dessert is it). Both settling on the crepes, Roger the more traditional Korean Yuja orange and lemon and me the chocolate. All you really need to know is that both plates were pretty much licked clean by the end. I found the staff here really friendly and happy to help, giving recommendations if you haven’t tried Korean food before. During the day they offer a variety of lunch boxes, with a soup of the week, a side and fresh fruit, and so if you are lucky enough to work nearby, go and check out their mittagsmenu. Bookings definitely recommended in the evening.